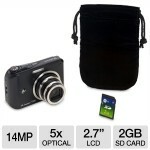 $59.99 For GE 14MP, 5X Zoom Camera with SD Card & Case with Free Shipping 12/16 | A Savings WOW! You can get a GE digital camera with 14 MP, 5X zoom, 2.7″ LCD, and also comes with a 2GB SD card and a camera case for only $59.99 with FREE shipping from Tiger Direct. The list price is $109.99, so that’s a savings of $50.00. Tiger Direct also has laptops, digital frames, LCD monitors, tablets, and more available with FREE shipping! Check out Tiger Direct for today’s free shipping deals!